Interviewer: Where do dog bites or attacks usually occur and who’s usually the victim? Richard Sailer: Surprisingly, they occur in a multitude of places. I’ve had cases anywhere from inside a liquor store, to my client’s own backyard where a neighbor’s dog has jumped over the fence, and everything in-between. Interviewer: Does it happen because the dog is provoked? If not, what’s usually the reason why it happens? Richard Sailer: Typically, it’s a dog gone awry. Often times, I think it’s might be out of fear or insecurity. However, this is just my personal opinion as I’m not an animal psychologist. I’m not an expert in dog behavior but I can say in most of the cases we have, the attacks were unprovoked. Interviewer: What types of dogs usually make these attacks? Richard Sailer: In terms of volume, it’s the smaller dogs that do a lot more biting but usually the injuries are not as significant as you hear about with the larger breeds of dogs. The notoriously vicious ones—Pit Bulls, Rottweilers, German Shepherds—those are usually the more significant cases in terms of serious injury. In terms of frequency, it’s typically the smaller, high-strung dogs that do a lot more biting. Moreover, it’s just that the injuries aren’t significant so you don’t hear about them. Interviewer: In Southern California, are there any particular leash laws for the area? Richard Sailer: Yes. Typically, the dog is required to be on a leash. We’ve even had instances where dogs are on leashes and still bite someone. I wouldn’t necessarily say that leash law prevents bites, but it usually gives the owner a little bit more control over the animal after an attack. Sometimes what we’ll see when dogs are on a leash are fights that break out between the two leashed animals. As a result, one of the owners gets bit in the process of breaking up the altercation between the two animals. 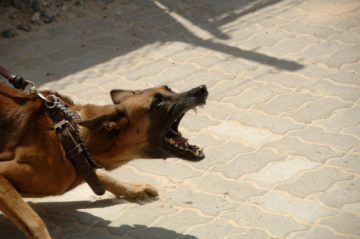 The instinct to protect your own dog often leads to the owner being bit while protecting them from another aggressive dog. Interviewer: What are some of the injuries that usually happen? What areas of the body do people usually get bitten? Richard Sailer: Most commonly, I see injuries on the hands and arms, so I think it’s a defense mechanism. When it’s a situation where the person knows that dog is coming at them, those are usually hands and arms because it’s in the course of trying to defend themselves from being attacked. On the other hand, we see the leg bites more often with people that are in the course of their employment—meter readers, mailmen, utility worker, telephone employees, cable installers. I typically see bites on their lower extremities because they’re walking in a backyard conducting business and the dog will sneak up and attack them from behind.